Not much of a surprise in this…. Despite the media push for those on the left of the Democratic group lined up for a run for the parties Presidential nomination? Biden HAS led in the early polling a year out from the 2020 Democratic primaries…. The surprise in the Emerson Poll is that Kamala Harris has risen above Bernie Sanders, Elizabeth Warren confirming that view that the California US Senator had a strong campaign rollout last week…. Former Vice President Joe Biden leads the field of potential Democratic presidential candidates by double digits among likely Iowa caucusgoers, according to a new poll. An Emerson College poll published Saturday found that Biden has the support of 29 percent of planned caucusgoers, well ahead of Sen. Kamala Harris (D-Calif.) who has the backing of 18 percent of likely caucusgoers. Biden has not yet announced a bid for president but has said that he is likely to make the decision shortly. Following Biden and Harris in the poll is Sen. Bernie Sanders (I-Vt.) with 15 percent and Sen. Elizabeth Warren (D-Mass.) with 11 percent. No other candidate received more than 6 percent of support….. Even with the high margin of error (6%) Biden is ahead in the poll…. The Iowa caucuses are still a year away, so the difference between 18% and 15%, in a sample poll taken this weekend, is not that significant. Joe Biden ….IF he runs? This is good news for Harris again…. 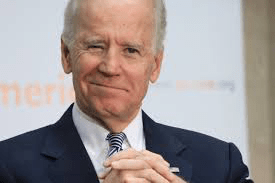 Biden hangs on to the lead…..
Warren moves up on Harris….. Remember a little less than a year out…. The list will be shorter when the actual event is done….